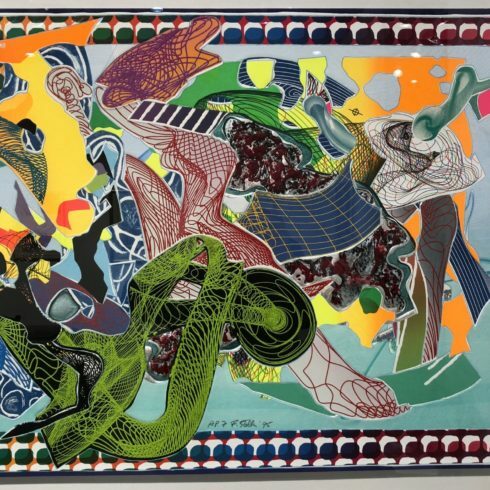 Frank Stella is an American artist best known for his use of geometric patterns and shapes in creating both paintings and sculptures. Arguably one of the most influential living American artists, Stella’s works utilize the formal properties of shape, color, and composition to explore non-literary narratives. Having moved to New York, Frank Stella was immersed in the heyday of Abstract Expressionism, but it was the work of Jasper Johns that inspired Stella’s Black Paintings from 1958-1960. These flatly painted, austere works, helped open up the doors to Minimalism. Through the following decades, Stella gained traction in the art world and in 1970 he became the youngest artist ever to be granted a solo exhibition at The Museum of Modern Art. 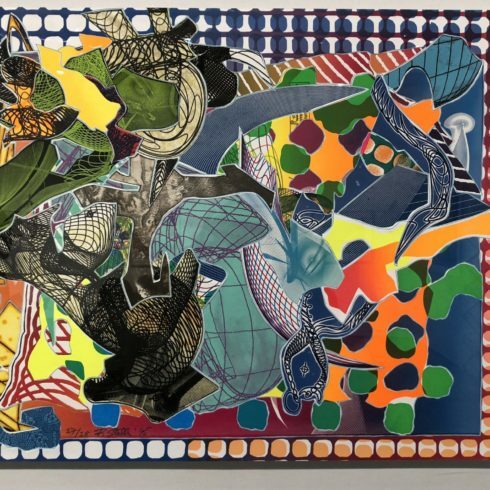 Frank Stella continues to live and work in New York, NY. 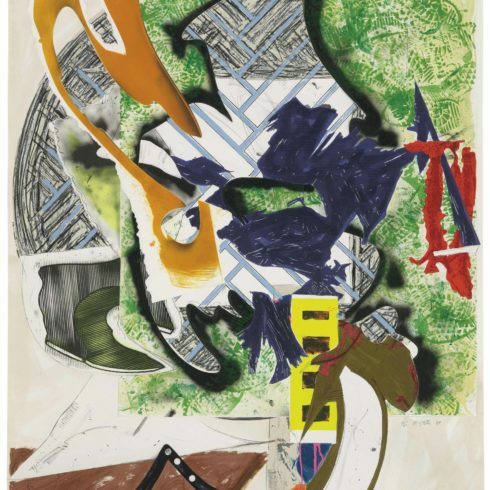 Today, Frank Stella’s works are held in the collections of the Metropolitan Museum of Art in New York, the Kunstmuseum Basel, the Art Institute of Chicago, the National Gallery of Art in Washington, D.C., and the Tate Gallery in London, among others. 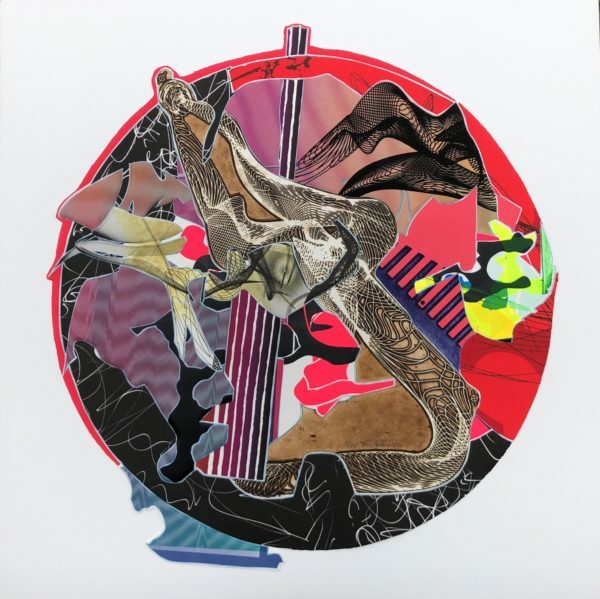 Our fine art gallery has the finest quality Frank Stella original lithograph, screenprint, etching, aquatint, relief and embossing in colors, on TGL handmade paper. We have a large inventory available off-site and we encourage you to make an appointment to see specific works you are looking to collect. We are happy to meet you at either our art gallery showroom or at your home or office for a private presentation. In the 1990s, Stella began making a freestanding sculpture for public spaces and developing architectural projects. In 1992–93, for example, he created the entire decorative scheme for Toronto’s Princess of Wales Theatre, which includes a 10,000-square-foot mural. His 1993 proposal for a Kunsthalle (arts center) and garden in Dresden did not come to fruition. His aluminum bandshell, inspired by a folding hat from Brazil, was built in downtown Miami in 1999. In 2001, a monumental Stella sculpture was installed outside the National Gallery of Art in Washington, D.C.
Stella’s work was included in several important exhibitions that defined 1960s art, among them the Solomon R. Guggenheim Museum’s The Shaped Canvas (1964–65) and Systemic Painting (1966). His art has been the subject of several retrospectives in the United States, Europe, and Japan. Among the many honors, he has received was an invitation from Harvard University to give the Charles Eliot Norton lectures in 1983–84. Calling for a rejuvenation of abstraction by achieving the depth of baroque painting, these six talks were published by Harvard University Press in 1986. The artist continues to live and work in New York.